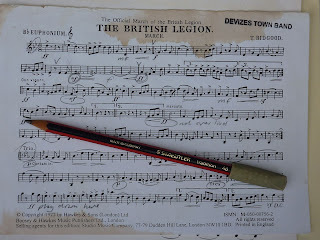 When I first began blogging about pens and pencils, one of my favourite blogs was the now-defunct Pencils and Music blog. Visit the website nowadays and you have the sad sign telling you that the blog is no longer available. It lives on though, if you visit through archive.org. Sean, the site owner, moved on to The Blackwing Pages blog, and had some bother with the company that resurrected the original Eberhard Weber Blackwing 602. I won't repeat the story here, as he says it so much better himself on his own blog. Pencils and Music discussed a lot of fine Japanese pencils such as the Pentel Black Polymer and the Tombow Mono 100. The reason I mention this is because I use a pencil for writing on music, even if I don't actually write music much. I may have mentioned before that I play tenor saxophone in my local community orchestra, and often make notes on the sheet music to adjust articulation or dynamics, or to remind myself when to take a breath without disrupting the flow of sound. 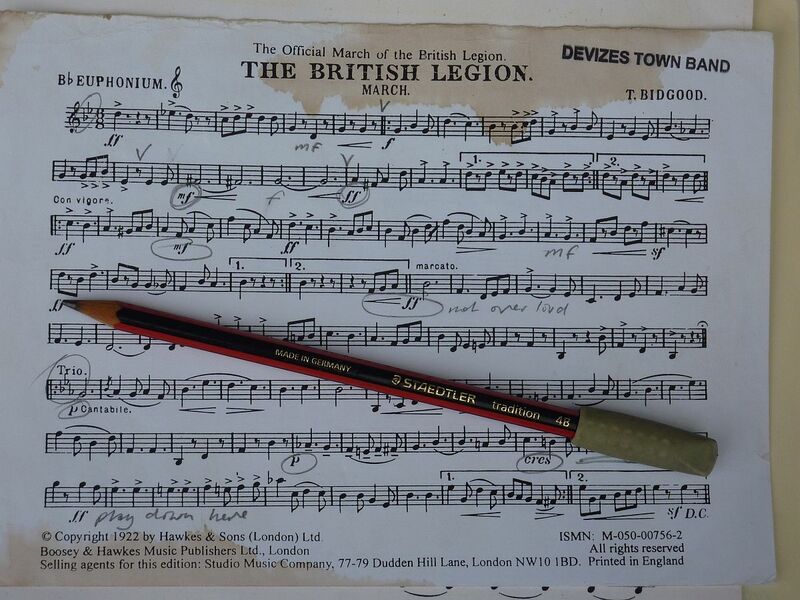 A pencil is a key tool in a musician's kit: I always carry a pencil in my music case. See the picture below which is my part for the British Legion March. (The first picture is a section of Gustav Holst's Second Suite in F, fourth movement.) Note that it's written for a euphonium even though I play saxophone - I often have to play euphonium music as often it has important sections of music and my instrument is tuned to the same pitch and has largely the same range. I have marked out where the crescendos go, and also where to turn the sound down a bit. For music parts I prefer a soft, dark pencil. I only make brief notes, and I need them to stand out between the staves. Lighter pencils such as HB or H are not bold enough, especially in low light or under stage lights, so I use a 4B, topped with an eraser. My pencil of choice is not Japanese, but German: a Staedtler tradition, topped with a Faber-Castell eraser. It's probably fitting that products from two bitter rivals should live together in my music case; I am reminded of this old song for some reason. No copyright infringement is intended - music reproduced here for illustrative purposes only.